I'm so excited to enter a quilt into Amy's Fall 2010 Blogger's Quilt Festival. I really love Amy, and I admire all the work that she puts into these virtual festivals that she hosts twice a year. What a fun combination of modern technology and traditional handiwork. My entry is one of my favorite quilts that I have ever completed. It's a red and aqua modern design, made out of wonky cross blocks. If you know me, you know that I rarely follow a quilt pattern, and this is another instance where I just kind of made it up as I went. 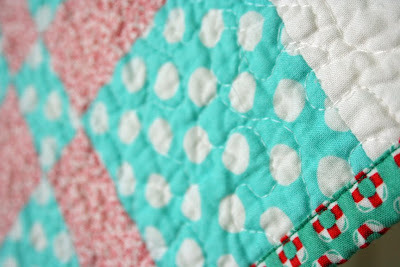 I started making the blocks in May 2009, but I didn't finish the quilt until September 2010. I quilted it with stippling throughout and I really love how crinkly it gets, especially after the first wash. When I open that dryer door, it's almost like a surprise on Christmas morning, because you never quite know what the outcome will be! 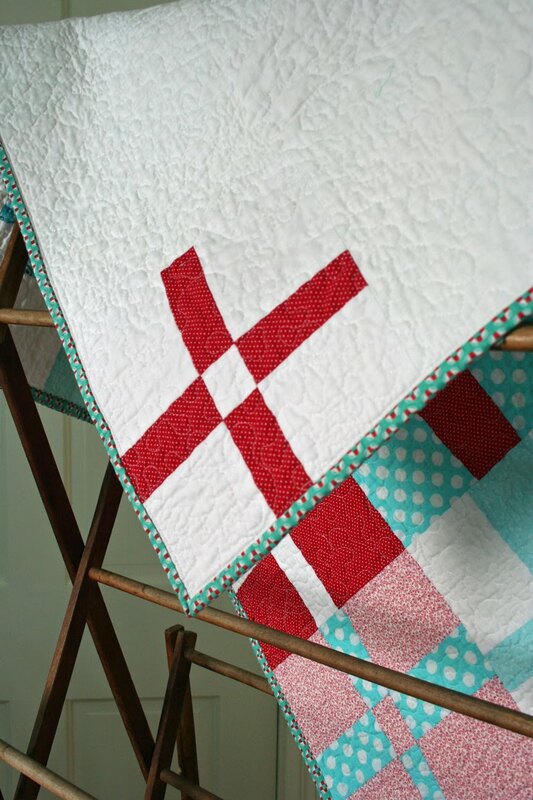 The binding is a print by Cosmo Cricket for Andover fabrics and I thought the design of the life savers was a nice compliment to the crosses in the blocks. I brought this quilt with me to my booth at the HandMade Market at the The Creative Connection in September. I'm really glad it didn't sell, because I really wanted to keep it from the beginning. And it was actually featured on local Minneapolis news during Nancy Soriano's interview about the event. So, of course I have to keep it now! oohh! love that quilt! I don't know how I missed it at TCCE?! Good luck! 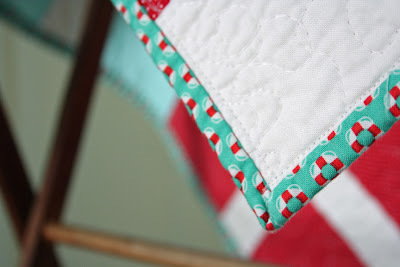 I love, love, love the lifesaver fabric you used on the binding! That binding is too cute! I LOVE it, so cheerful and bright. 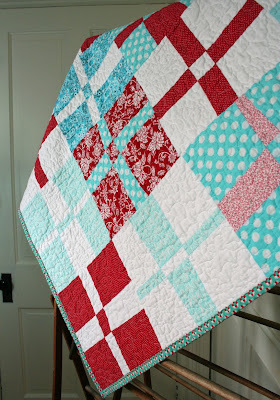 Love the quilt and the colors! It's beautiful! I love the single block on the back! Simply gorgeouos. Love the colours and the pattern. I love red and aqua against the white. It looks so fresh and crisp! 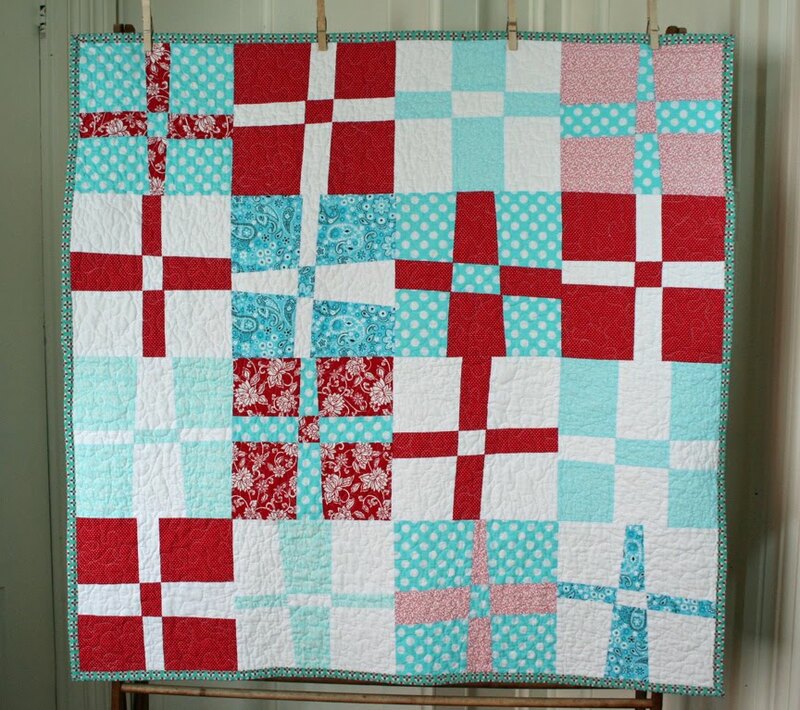 Your design and quilting looks great! I love crosses quilts and yours in wonderful. That binding is perfect! !